Interstate 93 is an Interstate Highway in the New England region of the United States. It begins in Canton, Massachusetts, in the Boston metropolitan area, at I-95; and ends near St. Johnsbury, Vermont, at I-91. 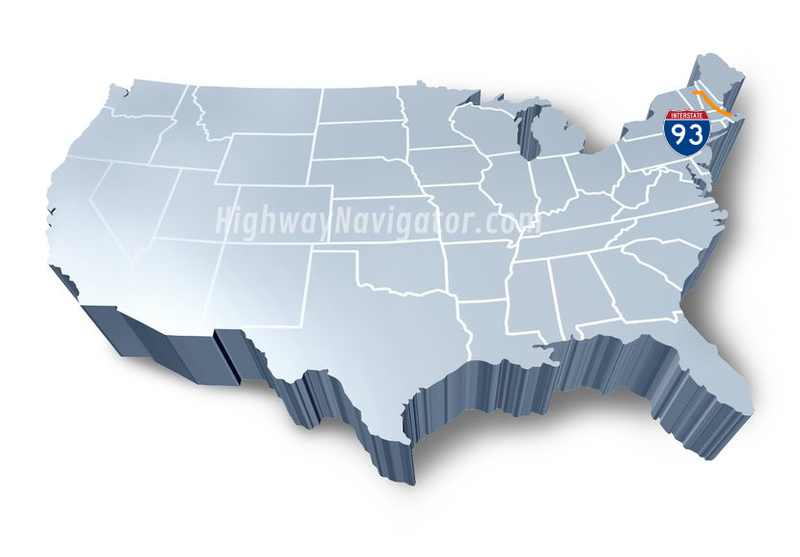 It is one of three mainline Interstate highways located entirely in New England, the other two being I-89 and I-91. The largest cities along its route are Manchester, New Hampshire and Boston, Massachusetts. It also passes through the New Hampshire state capital of Concord. For most of its length, I-93 indirectly parallels U.South. Route 3. Particularly in New Hampshire, the two highways have several interchanges with each other, as well as a concurrency through Franconia Notch State Park. I-93 follows the Southeast Expressway south of downtown Boston, the Central Artery through Boston, and the Northern Expressway from Boston to the New Hampshire state line.